After 30 years of using confiscated reworked 1911s, LAPD SWAT finally gets a state-of-the-art Government Model. Kimber .45 autos have pretty much been a success story right from the introduction of the first models back in 1995. The company recently obtained another accolade for one of its .45 pistols when it was selected by the prestigious Los Angeles Police Department SWAT unit. The model in question is based on the Classic Custom Model .45 that is the first Kimber .45 that I reviewed some six years ago. This new pistol has several special features specially requested by the SWAT unit. I was impressed enough with the Classic Custom Model that I had previously tested to eventually add it to my personal collection. The fact that the LAPD likes it comes as no surprise. Like my Kimber, this pistol closely follows the design of the famous 1911 model developed by Colt and John M. Browning. It employs Browning's swinging-link, tilting barrel system to lock the barrel and has the usual single-action trigger. The pistol has a full-length recoil spring guide rod assembly, a match aluminum trigger and a round, slotted match hammer. It has the standard controls of slide stop, magazine catch and safeties, all placed in the usual positions on the frame. The safeties include a thumb catch and a grip safety. The latter is unique to Kimber and is a beavertail design with an extended base that provides for a positive release when the pistol is held in the hand, while the thumb safety is of the speed type with a narrow lever. Special features include a checkered frontstrap and mainspring housing. While the sights are the same scalloped, low-mount type they have luminous tritium inserts for low-light shooting. The grip panels are checkered and made of the same black, synthetic, rubber-like material. 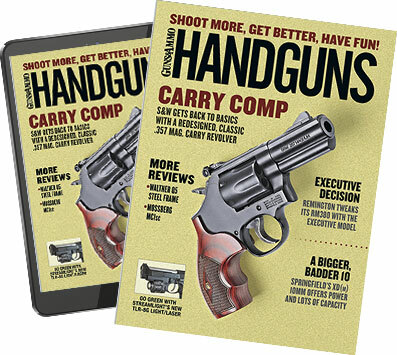 The pistol comes in a padded, black, lockable carrying case that contains a trigger lock, barrel bushing wrench, instruction manual and two spare magazines. The LAPD model displays the same high quality of fit and finish that has been evident in all of the Kimber arms that I have examined in the past. The barrel and slide-to-frame fit are tight, and all controls function smoothly and positively. Like the original Custom model, all metal components are finished with a nonreflective black oxide finish. The pistol has a very good, crisp trigger pull of just 4 1/2 pounds. The sights provide a very clear sight picture and have three luminous tritium inserts for shooting in poor light conditions. The inserts are such that they appear as white dots in normal light conditions, a feature that helps in aiming at black or dark targets. The checkered frontstrap together with the rubber grip panels provide a very firm, comfortable fit for my hands. I shot the pistol at the Petersen Ranch range on a pleasant, moderately warm summer day in August of 2002 using a selection of .45 ammunition that is listed in the accompanying accuracy chart. I began by shooting the pistol for accuracy at 25 yards from a bench using my Millett BenchMaster rest. The pistol delivered acceptable accuracy with all of the ammunition. The best group, measuring just on 2 1/8 inches, was shot with Federal Personal Defense 165-grain Hydra-Shok JHP, which is excellent for a service pistol. With respect to all the other groups, the pistol tended to have the usual four-in-one syndrome with one shot out from the others, spoiling what would have been an excellent group. perfectly regulated to shoot for the author's point of aim. (RIGHT) On the combat range the pistol gave a very impressive performance, grouping all shots in the 10-ring of the target. The pistol's good sights and trigger combined with its comfortable grip made for a very pleasant-shooting .45 with negligible felt recoil. Sight regulation was excellent, with the pistol placing all of my groups exactly at my point of aim. It was over my mini-combat course that the LAPD Kimber really excelled, placing all 10 shots in the 10-ring right of the combat center. The pistol pointed well and was easy to control when firing fast two-shot strings. NOTE: Shooting consisted of three 5-shot strings shot from a seated Millett BenchMaster rest at 25 yards. Weather conditions were clear with no wind. Elevation was 3,250 feet above sea level, and temperature was 75 degrees F.
The pistol proved to be perfectly reliable with all of the ammunition that I shot. In addition, I was especially impressed with the grip safety. Its extended base enabled me to rest the thumb of my shooting hand on top of the manual safety lever. When I do this with some other 1911s, I find that the grip safety is not compressed enough to permit firing. I also found that my thumb did not inadvertently apply the slim speed safety during firing, which is another fault that I experienced with other 1911s. Taking everything into consideration, I feel the LAPD has made an excellent choice in selecting this pistol for SWAT use. The pistol's modest custom features are just enough to enhance its performance without adding extra problems to its function and handling. The LAPD SWAT Team--the nation's first SWAT Team--has been using the 1911 Government Model since its creation more than 30 years ago. Prior to the purchase of the Kimbers, LAPD had been using 1911s confiscated from criminals and sending them through the LAPD armory to be brought up to snuff. While this saved the taxpayers of Los Angeles some dough, these platforms may be anywhere from one to 60 years old. After experiencing several major breakdowns during training, the department realized that it was time to standardize the officer's firearm. There was never any question about retaining the 1911 as the SWAT duty arm. It was not only the sentimental favorite, but also the arm that all had trained with since the SWAT Team was created. The 1911s record for reliability, durability and longevity had been well documented during that time. Since the SWAT Team members have many years of extensive training with a 1911, it would be foolish to choose another platform that would require an extensive retraining regimen. LAPD put five different 1911s through thorough testing. When the dust settled, only one was left standing--the Kimber Classic Custom II. The LAPD firearm is different from a box-stock gun only in that it is marked LAPD and has its own serial number range. Otherwise, this gun's special features are available through the Kimber Custom Shop for the Classic Custom II. The added features include fixed tritium sights, a checkered frontstrap and a light-rail below the frame for a Surfire flashlight.